You are here: Home / Church Talk / Reform your Religion–Or Get Out of It. When you think about it, there’s really only two kinds of people: those who reform their faith tradition, and those outside of it. Sometimes you happen across a social media comment that just ensnares your mind and you cannot help but share it. I just realized that there are only two options with regard to religion: be nonreligious, or be a religious reformer. Religion, like the human soul, cannot be static and unchanging. There is always something to improve, some growth needed. We can stay in a religious tradition and work on those growth issues from within, or we can leave religion and work on growth issues in secular communities. But we can’t escape the need to grow and evolve in enlightenment. So everyone in a religion is a reformer. I find truth in that statement. Whether you are a new convert to a faith or have been in for decades, you seek something more for your faith tradition. If you put your desired growth into action, you become an activist like I am regarding LGBTQ Inclusion in my United Methodist Church tradition. If you apply your desired growth to yourself, you commit to living it out privately either in the church or the community. So in that sense, being religious means being content with all that there is in a faith tradition. There’s always something more that could be transformed. And if you are not part of a religious tradition, you are outside of it. There’s no static place of being “religious” and accepting 100% all of a religion’s suppositions because one is always growing and seeking new ground to cover–and our engagement with faith reflects that. What’s that sound? The sound of keyboards clicking is the Orthodoxy movement revving up to claim that true religion then is orthodoxy, meaning the unchanging (questionable claim #1) Christian beliefs that surely must constitute true religion. All other religions are hacks because they allow for this kind of reform movements, whereas orthodoxy is pure and unchanging (questionable claim #2). …even people who try to resist change are actually reformers. Culture changes, norms and values change, and some people within a religion realize that the most accurate reflection of their religion’s core values requires changing some of their traditions. Other people try to change their religion’s core values in order to preserve the traditions. Either way, they are trying to reform something about the religion. So even the most fetishy of orthodoxy advocates is trying to reform something, either by reforming a religion’s culture to be more orthodox, or reforming practices to reflect beliefs. And by doing so, they cease to be “religious” people who are content with religion and become just as much a reformer as the unorthodox, just focused on a different category of religious expression and belief. In my Wesleyan tradition, following the Anglican reformer John Wesley, I think this brilliantly applies one of Wesley’s personal faith development concepts to the larger faith community. Sanctification, to Wesley, is the spiritual development stage after conversion that calls a Christian to continue growing in the faith, seeking perfection that may or may not be ultimately obtainable. So throughout a person’s life after they have accepted Christ and experienced justification, they are constantly growing and becoming better images of Christ on earth. Perhaps we have our model for what the Church is to be in the Christian tradition. The Church is called to this constant assessment and testing of the spirits to see if they stand the test of time, and whether they reflect the holiness to which all are called. Far from the stagnant ponds of orthodoxy that grow moss upon human experience, such a call draws up the fullness of human experience into a mighty river that washes over the rough edges of church and society and makes them smoother for all who come after. May we live out this call to sanctify our church traditions even as we as individuals are sanctified as well. Maybe one day to be “religious” will automatically include this sense of reform, and then “religious” will truly be what all are called to be. The lack of a category for “stagnant religious” appeals to me, not only as a Hacker of Christianity to be more open and give the Spirit more room to breathe, but it also gives each person a charge to either make their religion better, or get out of it. I wonder…is this Christian-centric? I wonder if this is true in Islam and Buddhism as faith traditions that demand more submission and peaceful acceptance. Readers? Thanks for reading and your shares on social media! If the only constant is change, than God, if he/she is constant, is change. I’ve been in the Episcopal church for 45 years (since I was 7) and though a lot of what we do is based on tradition, I love the fact that we’re pushing for change. Women priests, women bishops, gay priests, gay bishops, the inclusion of the LGBTQ community, etc. Growing and changing doesn’t mean easy and fast – and some people are going to complain and leave but to truly accept God, I feel we truly need to accept change. Matthew, I love this puzzle – change is the only constant… except when it’s not. Wheeee! To me, there is SOMETHING constant about God/ess, even if that something is simply the power of being over nonbeing. But if change is inherent to the power of being… fun paradox!! Some people are more tolerant of change than others, psychologically – and I argue that in a changing world, those people have to change underlying values in order NOT to change traditions. So there’s truly no escaping change. Thank you for your analysis. I view the “reformer” or “orthodoxy” as a continuum rather than either/or. From my perspective as someone on the “reformer” end of the continuum, I observe some, through their words and actions, as somewhere along the continuum straddling reform and orthodoxy…depending on where they stand, in their sanctification holding orthodoxy as primary, or, holding reform as primary. The river of the movement of the Holy Spirit is moving in the midst of the straddling…we are called to listen and respond. Kay I really like your ideas about a continuum – and progressives can be just as rigidly fundamentalist as conservatives, for sure. We all end up having some tradition or other that feels so sacred to us that we resist changing it, even when it becomes apparent that the tradition causes problems, is oppressive, has outlived its value, etc. I agree, we are all called to listen – we can’t divide into smug factions or exert coercive power over each other. If we are to be a living community, we must do this work together, somehow. Thanks for the thoughtful comment. So then people are left with a choice: either change their religious traditions, or change their religion’s core values. We can’t have it both ways. So the people who try to hold on to traditions, even when it becomes clear that those traditions are oppressive, are reforming their religion to become more oppressive in its core values. 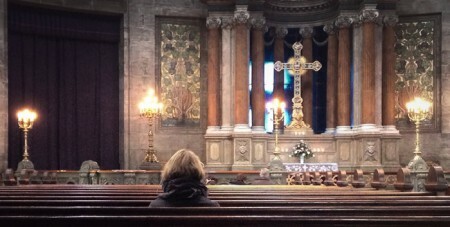 While one might experience God’s justifying grace in isolation of the called, gathered, and sent community called the Church, there can be no growth in grace… no growth into a sanctified and sanctifying life without those mutually accountable, interpersonal, and discipling relationships found exclusively within the Church. Just as God is inherently relational (three persons eternally in relationship within the Godhead), we too are relational creatures ontologically, having been made bearing the image of God. It simply goes against our created nature to act as though we were autonomous beings. The same is true of associations. Reform or refine your associations or cease them. Will ‘Better’ Catechism stop LGBT Inclusion? An Open Letter to the #PCUSA: Don’t Be Like Us. Be Better.